I would have liked the job of being the person to give fish their names. Yet I doubt I could have come up with such a terrific roster of appellations, ranging from the playful (clownfish) to inspiring (stargazer) to humorous (oldwife) to poetic (barramundi) to romantic (kissing gourami) to downright confusing (spiny dogfish?!). Diving and snorkeling in the pristine waters surrounding the Turks & Caicos Islands, you can’t help but notice the hundreds — maybe thousands — of, well, big-eyed red fish congregating in small to largish schools on most reefs. There are scores of species of Cardinalfish, most of which hide out in shallow reef areas ranging from four feet in depth to well over 100. A few species live synergistically with tube sponges and anemones. You wouldn’t guess it from Barbara’s terrific close-ups, but these little creatures (measuring just one to three inches) are not usually approachable by humans. When they feel threatened, they beat a hasty retreat under rocks and into crevices. But they’re not always so discriminating. One species is known to take cover inside of conch shells—often with the owner still inside. Ranging in hue from brilliant red to light pink (and occasionally greenish, yellow-brown and silver), the Cardinalfish may stand out like a sore thumb to us, but his nocturnal nature is part of his intelligent design. In low light, he’s practically invisible to other fish (who don’t see the full spectrum we see). Conversely, his large eyes give him a competitive edge on his rivals in seeking out the tiny fish and crustaceans he so adores. 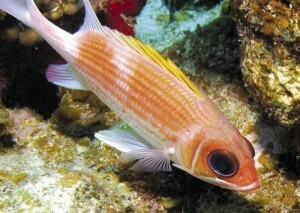 Another interesting tidbit about the large-eyed, short-snouted Cardinalfish is their style of reproduction. These critters are mouth brooders, meaning that once the eggs are released and fertilized, usually the male will store them in his mouth to incubate, often carrying them until they’ve hatched. During this time, an expectant papa will often forego food for up to two weeks — and let mama take on the warrior role of fighting off aggressors. It’s not just fans of Rocky and Bullwinkle who love Squirrelfish. These bug-eyed red fish are considerably larger than their Cardinal cousins, measuring between 12 and 24 inches. Counterintuitive as it might sound, their bright red color (often marked with yellow, white or black spots) serves as camouflage to help them blend in with the bold colors of the coral reef. 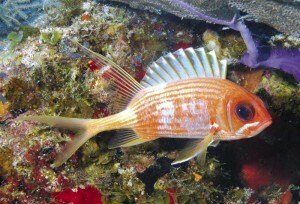 Some Squirrelfish have stripes, rough scales and sharp spines. Their eyes resemble a squirrel’s, and their long rear dorsal fin protrudes upward, much like its terrestrial namesake. 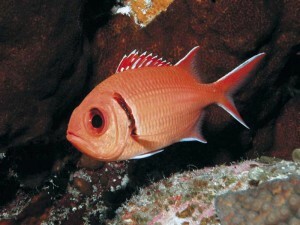 Like Cardinalfish, Squirrelfish are nocturnal, preferring to chill out underneath rocky surfaces in the reef during daylight hours. But at night, it’s a whole different ballgame: they fan out over the reef to forage for dinner, sometimes diving more than 500 feet in their quest. Thanks to George Burgess of the Florida Museum of Natural Hisory for his valuable input to this article.